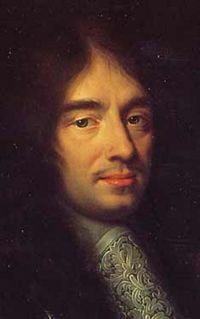 Charles Perrault (January 12, 1628 – May 16, 1703) was a French author who laid foundations for a new literary genre, the fairy tale. In 1697 in Paris, Perrault published several tales from the oral tradition that he modified with his own embellishments. He was almost 70 years old when he wrote his Histoires ou Contes du temps passé (also known as Mother Goose Tales). They enjoyed instant success. The book contained eight fairy tales and he would eventually record a total of 11 fairy tales. All his tales were written in prose with a moral at the end. The best known of these tales include Le Petit Chaperon rouge (Little Red Riding Hood), La Belle au bois dormant (Sleeping Beauty), Le Maître chat ou le Chat botté (Puss in Boots), Cendrillon ou la petite pantoufle de verre (Cinderella), La Barbe bleue (Bluebeard), Le Petit Poucet (Hop o' My Thumb), Les Fées (Diamonds and Toads), La Marquise de Salusses ou la Patience de Griselidis (Patient Griselda), Les Souhaits ridicules (The Ridiculous Wishes), Peau d'Âne (Donkeyskin), and Riquet à la houppe (Ricky of the Tuft). His collection has had a wide ranging and long lasting impact. His pioneering efforts were later emulated by the Brothers Grimm and Hans Christian Andersen. Title page from an 1867 edition of the Charles Perrault's fairy tales entitled Les Contes de Perrault. Perrault was born in Paris to a wealthy bourgeois family, son of Pierre Perrault, an eminent barrister, and Paquette Le Clerc. He had a twin brother who survived only a few months. His brother, Claude Perrault, is remembered as the architect of the severe east range of the Louvre, built between 1665 and 1680. Charles Perrault was almost 70 years old when he wrote his Histoires ou Contes du temps passé (also known as Mother Goose Tales). At the age of 15 Charles abandoned his formal schooling and set about educating himself. He studied law before embarking on a career in government service. In 1654 his brother Pierre became receiver-general at Paris and made Charles his clerk. When the Academy of Inscriptions and Belles-Lettres was founded in 1663, Perrault was appointed its secretary. He gained the position after writing a poem on the sale of Dunkirk to France. His poem was seen as evidence of his ability to be a member of Jean-Baptiste Colbert's select 'petite committee'. In 1665 he was appointed to the position of First Commissioner of Royal buildings, a position that allowed him to appoint his brother Claude as the architect who would complete the Louvre, construct the Observatory of Paris and complete the decorations of La Place du Troni. He took part in the creation of the Academy of Sciences as well as the restoration of the Académie des Beaux-Arts. In 1671, shortly after writing the poem "Carrousel de 1662," he was elected to the French Academy. In 1672 he was elected Chancellor of the Academy and set out to reform Academy procedures. On the day of his inauguration he caused the public to be admitted to the meeting, a privilege that has been continued ever since. The same year he was appointed General Controller of Buildings, a position created for him by Colbert. He would later convince Colbert to establish a fund called Liste des Bienfaits du Rol, to give pensions to writers and savants not only in France but in Europe. By age 55 he was effectively in retirement from his public service and applied himself more to the affairs of the Academie and to writing. During this time he produced many large scale poems of Christian inspiration. His first literary attempts were a parody of the sixth book of Virgil's Aenid, and a short poem, "Les Ruines de Troie ou l'Origine du Burlesque." As a poet he attempted to revive the old epic, adapting it to a Christian subject, in "Saint-Paulin" (1686). As a long time public servant under Louis XIV he wrote prolifically of the King and his achievements. He wrote everything from mottoes on commemorative medals to panegyrics on military victories. Perrault was a loyal servant of the crown and as such his writings reflected a concerted effort to promote the prestige of the King. His preface to "Le siècle de Louis le Grand," soon followed by "Parallèle des Anciens et des Modernes," started the famous literary quarrel of the Ancients versus Moderns. He asserted that under Louis XIV the arts had reached new heights never before achieved. His argument did not set well with those who revered the legacy of the Greeks and Romans. Jacques-Benigne Bossuet, François Fénelon, and Nicolas Boileau-Despréaux argued for the Ancients. To defend his theory he wrote Le Parallèle des Anciens et des Modernes en ce qui regarde les Arts et les Sciences (Parallel between Ancients and Moderns Concerning Arts and Sciences), in four volumes. As the main defender of the Modernism trend he maintained that progress was possible only through the Catholic faith and loyalty to the Christian King. Illustration for Charles Perrault's La Belle au Bois Dormant from Histoires ou Contes du Temps passé: Les Contes de ma Mère l'Oye (1697). 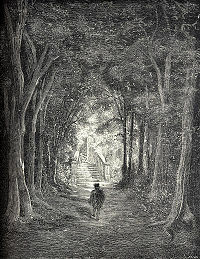 Gustave Doré's illustrations appeared in an 1867 edition entitled Les Contes de Perrault. He married in 1672 to Marie Guichon, 19, who died six years later in 1678, after giving birth to a daughter. In addition the couple had three sons. In 1695, when he was 62, he lost his post as secretary at the Academy of Inscriptions and Belles-Lettres. He decided to dedicate himself to his children and published Tales and Stories of the Past with Morals (Histoires ou Contes du Temps passé) (1697), with the subtitle: Tales of Mother Goose (Les Contes de ma Mère l'Oie). Its publication became an instant success and he became widely-known beyond his own circles. With its publication a new literary genre was born, the fairy tale. He published it under the name of his last son (born in 1678), Pierre (Perrault) Darmancourt, (Armancourt was the name of a property he bought for him), probably fearful of criticism from the "Ancients." In the tales, he used images from around him, such as the Chateau Ussé for Sleeping Beauty and in Puss-in-Boots, the Marquis of the Chateau d'Oiron, and contrasted his folktale subject matter with details and asides and subtext drawn from the world of fashion. Perrault died in Paris in 1703 at age 75. At that time "Perrault’s Contes" were at the peak of their popularity. They were tales that people had known since their childhoods and publishers, aware of what popular readership could mean financially, released many editions of the "Contes," in formats and prices accessible to the masses. 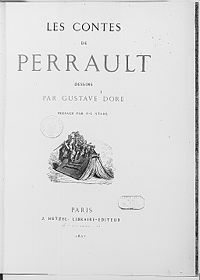 Perrault acquired unprecedented popularity, and between 1842 and 1913, there were no less than 233 editions of his fairy tales, by more than 60 different publishers, which amounted to an average of three or four publications annually. In March 1993 the town of Eaubonne, France, created the Charles Perrault Literary Critics' Award, a national prize for the best published or unpublished books and articles, in the French language, dealing with children's literature. ↑ Oscar Fay Adams. Dear Old Story Teller. (original 1889) (republished by General Books, 2009. 9781110761081) Books.google.com. Retrieved February 1, 2010. ↑ , in the Original Catholic Encyclopedia Oce.catholic.com. Retrieved February 1, 2010. ↑ Charles Perrault Oce.catholic.com. Retrieved February 1, 2010. ↑ Lydie Jean, Charles Perrault's Paradox, in Trames Kirj.ee. Retrieved February 1, 2010. ↑ Jean Perrot, Charles Perrault and Jean-Jacques Rousseau to the Rescue of French Research: Literary Symbolism, "The Purloined Letter" of Research, The Lion and the Unicorn 19 (1) (June 1995) Muse.jhu.edu. Retrieved February 1, 2010. All links retrieved February 6, 2017. Fairy Tales of Charles Perrault Surlalunefairytales.com. James, Jamie. 2009. Book Review: 'The Complete Fairy Tales' by Charles Perrault Latimes.com. Orenstein, Catherine. 2004. Dances with Wolves Msmagazine.com. Jean, Lydie. 2007. Charles Perrault's Paradox kirj.ee. This page was last modified on 6 February 2017, at 22:19.